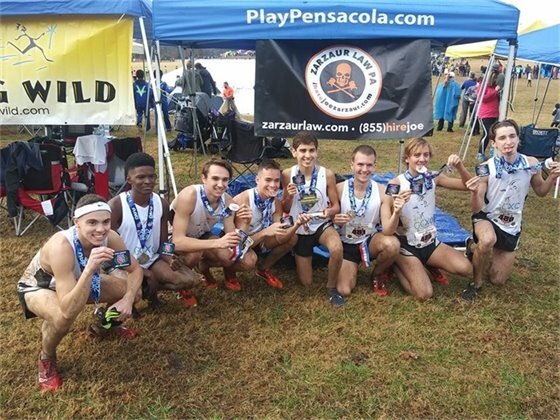 (Pensacola, FL) - A cross country team that was started just last month by the City of Pensacola Parks and Recreation Department has already taken their first national award at the AAU Cross Country National Championships today. Eight young men representing Escambia and Santa Rosa counties ran in the 5K contest Saturday, December 1 at Victor Ashe Park in Knoxville, Tennessee, collectively taking second place amongst 6 other teams in the 15-18 year old age group. "The race was a grind, but through our hard work and perseverance the team was able to pull through and become national runner-ups," said Rory Carmody, West Florida High School Senior. The GCXC G.O.A.T. (Greatest of All Time) Farm is comprised of eight high school cross country runners who have been training together for just three weeks. Team members include Francisco Ramirez-Pace High School, Brandon Knieja-Tate High School, Richard Whatley-Pine Forest High School, James Simkins, Jr.-Pensacola High School, Rory Carmody-West Florida High School, David Milburn-Booker T. Washington High School, John Trawick-Booker T. Washington High School, and Daniel Holzknect-Booker T. Washington High School. The team holds weekly practices at the Fricker Resource Center where the athletes are trained and coached by Michael Mims and Lendward Griffin of Pensacola Parks and Recreation. The team is open to area high school boys and girls to participate in local, regional and national runs and supplement their regular high school cross country training during the off-season. The GCXC team is sponsored by Running Wild and Zarzaur Law, P.A. Results from the meet are available at http://adkins.trackscoreboard.com/#/results/meet-xc/107/scoreboard-xc/results/2. GCXC GOAT Farm team takes 2nd Place at AAU National Championships in Knoxville, Tennessee. Pictured left to right: David Milburn, Richard Whatley, John Trawick, Brandon Kneija, Francisco Ramirez, Daniel Holtzknecht, James Simkins, Jr., and Rory Carmody.